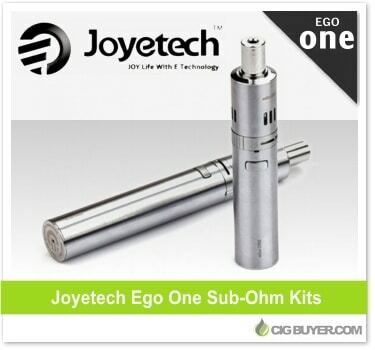 Simple and compact, the Joyetech Ego One is an awesome device for both beginners and advanced vaping enthusiasts. Users can choose from a standard, replaceable 1.0 ohm coil, or a low resistance 0.5 ohm coil for sub-ohm vaping (both included). It comes in two different versions: a smaller 1100 mAh kit with a 1.8ml tank, and a second 2200 mAh kit with twice the battery capacity and a larger 2.5ml tank. They work exactly the same way, you just choose the size (and price) that fits.